So, I'm not a big Valentine's Day fan.... but I AM a big chocolate fan! So, when I discovered this recipe for Puffed Quinoa Chocolate Bark over at wellplated.com 2 years ago, I knew I had to make it ASAP. It was so good, I filed it away to make again in the future. Fast forward, and I've made it again with my own little twist. 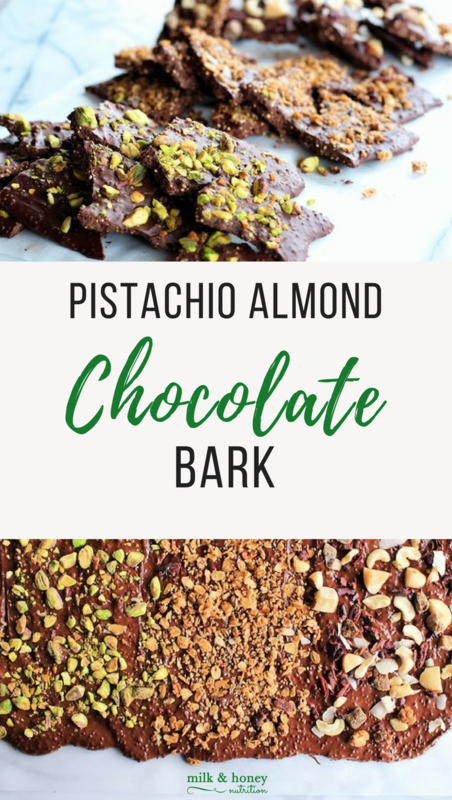 This Pistachio Almond Chocolate Bark is the perfect gift for a loved one, friend, or co-worker any time of year! Customize it with your own favorite toppings, and be prepared to be loved! Tip: I use Enjoy Life Foods semi sweet chocolate chips, or HEB Organics chocolate chips. both are dairy, soy, and nut free... and make for a good, clean, allergen friendly dessert. Read the tutorial over at wellplated.com to puff your quinoa. Combine puffed quinoa, melted chocolate, and almond extract in a bowl and stir to combine. Spread evenly on a parchment lined baking sheet to desired thickness. I recommend 1/4 inch. Add pistachios (or other toppings), and press lightly with hands or the back of a spoon to ensure they stick to the chocolate. Place in refrigerator for one hour. Remove from refrigerator and break into pieces. Place in an airtight container and store in refrigerator for up to one month.